I suggested to Alan that Alabama, Mississippi, and Louisiana be added. Obviously, Florida is the safest option for relatively warm weather. But as long as one is near the Atlantic or the Gulf, the other southern states are a pretty good option. I have trip reports with maps for some of those states, but I have to change the code so the pictures meet the 800 pixel limit. 1. These are not the southeast states as defined by the US Census Bureau, but rather those states of interest to snowbirds (from eastern Canada and the US) looking for paddling action when they can’t find it at home. 2. The following is but a first try; I’ll be adding information as I find time. And I’ll prepare separate posts, in time. Material will be copied and posted here, sometime. Many entries provide only a map; still, that tells the paddler that the opportunity exists. Entries appear not to be ordered in any fashion; even the position in the file changes between inspections. Except as noted explicitly, entry counts were made on 6 November 2012. 5. If there is enough interest, I’ll post similar information for other states. To do so, however, I’ll need help from the members, at a level comparable to that provided for the southeast. Ed note: No Routes seen. Ed note: Very little information. Ed note: Not unexpectedly, not much information. Five entries at time of posting. Ed note: My search found not even a map. 40-60 entries on 18 November 2012. 80-100 entries on 18 November 2012. Last edited by Allan Jacobs on January 31st, 2013, 4:22 pm, edited 3 times in total. There is a bit of discussion on Pnet re just off I 95 paddling. There are some pretty nice runs in Tennessee and Kentucky as well. Clear Creek, the Buffalo, the Sequatchie (Tennessee), the Red River (Kentucky), the Big South Fork of the Cumberland (Tennessee/Kentucky) and others. Are those runs in Kentucky and Tennessee attractive in the winter? If you have a drysuit and fleece maybe.. I think you will have a lot of suggestions, given the way the title reads , that do not pertain to attractive winter paddling. The adjective "attractive" means different things to different people. Many people from Southern New England south enjoy day paddles year round where rivers are not frozen. But if you confine the routes to overnight routes and not those requiring winter camping skills the database will shrink. Well, conditions are certainly generally not colder than they are in much of Virginia and North Carolina. Obviously, a lot will have to do with ambient air temperatures and if one is driving down from Canada to do an overnight trip, an element of luck with regard to the weather will be involved. The further south you are willing to drive, the warmer it will be, obviously. Streams in this latitude of the eastern US virtually never freeze solid in the winter. Certainly the water is colder than it is in the late spring through fall, but unlike the western US or areas further north, the stream flow generally does not consist of snow melt but rather natural flow. I live at the same latitude as northern Virginia and Kentucky and try to paddle at least a couple of times a month throughout the year. I virtually never wear a drysuit for Class I-II water, but I don't wind up in the water that much. Obviously on an overnight trip one would have to be prepared for the possibility of getting wet. I paddled in the mountains of western North Carolina last New Year's Eve weekend. It was 70 degrees and sunny. Variable is the word that comes to my mind for western NC.. Asheville can be lovely and 70 degrees in mid January. So it depends on altitude. Just like here. I live at the same latitude as the White Mountains. Its some ten to twenty degrees colder there. At 300 feet, its 46 F now. Thirty miles away due west at 6000 feet it is 19. Obviously, winter conditions in the southern Appalachian Mountain area will vary considerably. But none of the rivers I mentioned are Appalachian Mountain streams. The Buffalo, Duck, and Elk Rivers are all in the central basin area of Tennessee. They and the Sequatchie River a little further east all lie below 300 foot elevation. The Red River Gorge, Clear Creak on the Cumberland Plateau, and the Big South Fork of the Cumberland are a little higher up, but still well below 1000 ft elevation, a far cry from the 4500+ ft elevation of Unakas. Incidentally, last year was an unusually warm one, but the last week of December 2011 I drove across the Cherohala Skyway between Robbinsville, NC and Tellico Plains, TN and saw only a very little snow, even at Haw Knob (5400 ft elevation). 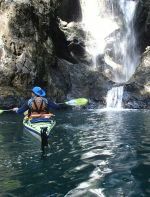 Found an online downloadable book for paddling the Big Bend coast of Florida which is really quite unspoiled with numerous wildlife reserves. This looks like an excellent area for a one-week or 10-day series of day-trips from a base camp. Would you know of a campground that would make a good home-base for a visit to the area? Any ideas about where to stay? I am looking up campsites in the National Wildlife Refuges..so far I have only camped at Goose Pasture in the Aucilla NWR (free, picnic tables, outhouses, no water). Its a bit too far north so I am in search of others in the area. Planning a January trip. There are four campgrounds mentioned in the book above on this website as well as other lodging suggestions. Whitewater canoeing may not be the primary interest of most folks here, but it seems somewhat in keeping with the theme of this thread to mention an annual early spring whitewater canoe gathering that was initiated by a group of crazy Canadian paddlers who have been invading the southeastern US on an annual basis for some years now. Personally I think they are still somewhat sore over that incident that occurred back during the War of 1812. This event attracts some of the best whitewater open boaters in North America, including Paul Mason, Andrew Westwood, Mark Scriver, Tommy Hagg, Dooley Tombras, Eli Helbert, and (of course) "Louie" (Michael Bruce Lewis). Most long distance canoe trips are planned well in advance. I would urge people to use caution in planning trips in winter to places like the Carolinas, Virginia, Kentucky or any place that does not touch the Gulf of Mexico. I have been in Atlanta, Georgia when the high was 14 degrees F with blowing snow. No need to travel all of that way to find weather similar to being at home. Even some trips to Florida can be disappointing unless you get to Miami.